Note how the parking is set off of the corner quite a few feet, and that there is still a proper sidewalk for pedestrians. This works better for everyone, and makes the Patachou corner appear lively with their corner patio. I realize this is a bit of an apples-and-oranges comparison, and that Pennsylvania Street doesn’t have near the traffic issues. But it’s a more approachable property. Perhaps someday the 54th and College parking lot argument will look silly. Perhaps maybe the owner might even look to that asphalt at his backdoor and think of other uses for it, such as bocce ball or other outdoor recreation. I have little doubt that if the owner is really worried about his property value after the Red Line is constructed, some new enterprising owner may look to capitalize even more on the southwest corner of the intersection. We also live nearby and avoid walking along M&J’s for this same reason, especially when the kiddos are with us. When you use the word “grandfathered” it implies the property received some sort of legal right to use the public right-of-way, and I wonder if that’s actually the case, Assuming it’s not, it’s likely not going to be a condemnation case. There is something called an inverse condemnation, which in legalese basically means that you can’t take away all access to a property (though not taking any part of the property itself) without compensation. From the analysis you provide, it appears that’s not the case either. Thanks for the clarification. I admit to not knowing proper legal terms. Is this really eminent domain as the article states? That is what INDYGO is proceeding with. I used Google Maps to measure the distance from building to sidewalk on the College side. Guess what? His property extends 12 feet…not enough for any legal parking space. Mack (and prior tenants, including the Bulldog and Tuchman Cleaners, going back 30 years) have been parking cars across the paved-over public sidewalk. He does, however, have enough room for a one-way drive aisle, which is what appears to be engineered in. With only about 30 parking spaces to begin with, obviously some people walk or park on the street when going to Moe and Johnny’s. The parking on the street near the corner will be somewhat limited by the new street/traffic design and by competition from visitors to other businesses there. I predict the roof parking at Fresh Market will soon become very popular. Agreed that the spaces are likely illegal. That curb cut along the whole College frontage has been there forever, it’s even there on the 1937 aerial in MapIndy. The thing that doesn’t make sense to me is providing a drive aisle between the building and the sidewalk. What extra benefit does that weird solution provide that a simple curb cut in line with parking lot drive aisle couldn’t? It looks as if there are three purposes: 1) keeps Mack from having to re-orient the slant parking so that it enters from the alley, 2) makes up for the lost direct left turn into said lot, and 3) allows closing the curb cut and gaining one or two street parking spaces. To me the logical approach would be to enter parking from the rear, but then people could only exit southbound. That’s not a huge issue, just go south and turn right at 53rd to get back to Central to head north. you can’t rely on Google maps to get accurate measurements of property lines. I measured from the edge of the building to the edge of the sidewalk (where it’s buried under pavement is quite visible on the aerial photo). 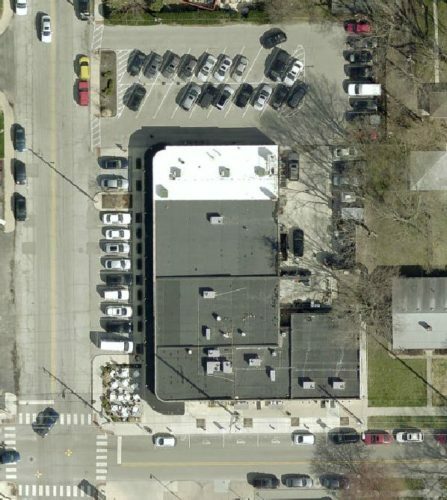 Even if Google’s off by as much as 3 feet (unlikely), the space from building to sidewalk is a maximum of 15 feet and the smallest allowed parking space in Indy is 18 feet long. Fortunately, thanks to the road diet from the Red Line, traffic will (hopefully) no longer be doing 50mph+ down College. Serious question: what traffic calming? I was hoping for traffic calming features as well, but I don’t see any of that here. I see new turn lanes on 54th to move more cars more quickly, and loss of parking buffers on all sides. Losing the extra northbound travel lane and the curb extensions at other locations along the route is going to be great, but the changes at this intersection seem to make the pedestrian experience worse than it is today. There’s no street parking around Moe & Johnny’s now (other than the aforementioned head-in parking) nor at Fresh Market. Only the north side of 54th west of College, and south side east of College, currently have street parking. Adding left turn lanes there will actually promote car and pedestrian safety as it will be easier for a ped or other driver to tell where a driver is going based on his/her position (and not on his/her signal or failure to signal). It will also make it easier for drivers to see pedestrians crossing as they approach the intersection from the east or west. Crossing distances for pedestrians will be the same as they are now. Additionally, the curb bump-out at MJs takes 2 existing lanes down to 1. It would be difficult for drivers to negotiate that space at highway speed. Thanks for the reply. There actually is a parking buffer on College in front of Fresh Market. How does the turn lane it make it easier for drivers to see pedestrians? I agree on the College side of Fresh Market. But only Jazz Kitchen/Yats is “surrounded” and has street parking on both sides. If you’re on 54th turning left but behind a couple of cars going through or turning right, your visibility is limited and it’s hard to know what’s happening. If, instead, you are allowed to slide past those other cars and get “in the box”, you have a clear view of everything on the corner and can make better decisions about when and how to move. 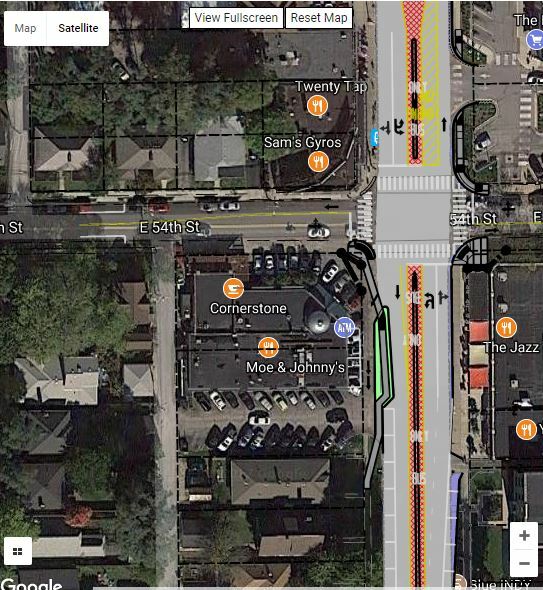 Keep in mind that there will be a few more cars trying to turn left at all the signalized intersections since the center bus median will prevent turns elsewhere (as at 53rd). There will be no on street parking from about mid block 53rd to 54th and on to just south of Bungalow court on the east side of College. This will be a through lane, bringing traffic that much closer to outside dining. 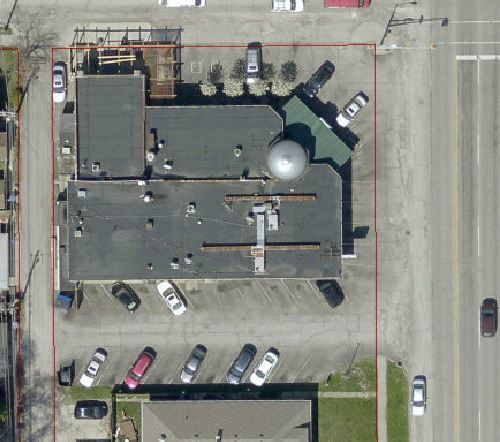 Fat Dan’s, Sam’s and Twenty tap will also loose on street parking, again with a thru traffic lane right next to diners. Not according to the plan shown above…street parking resumes on SB College right at the current M&J’s lot. Let’s keep score now on your “urbanism” model, shall we? The Broad Ripple Parking Garage–how did that go over? Not at all. Huge failure and waste of taxpayer money. How are The Coil and Fresh Thyme doing? Does anyone know? They don’t appear to be taking off, either. No big bragging about them being a major success. So, now, you want to kill Moe and Johnnie’s, a thriving neighborhood business, to build completely unnecessary dedicated lanes for your dumb little bus, which will also fail. Are you beginning to get the picture that your ideas don’t fit in this neighborhood? How much money has to be wasted before those in charge see the light and stop this crap? What? You are getting more incoherent by the day. Since when is the Broad Ripple Parking garage a model of urbanism? or when did it ever receive major support here? How is Fresh Thyme doing? Does anyone know? Are you stating that you have no idea and then insinuating with zero evidence that they are doing bad? Your comments are so low effort that I really shouldn’t respond anymore. On 1: Yup, you can look at all of our articles critical of the BR parking garage here. Our commentary on it has mostly been neutral-to-negative. On 2: I really like the Fresh Thyme, although I can see why Good Earth didn’t want that to happen. The Coil building isn’t awesome looking, especially from College. The canal portion is decent. I appreciate the new residents in Broad Ripple that will help keep shops open. On 3: Dumb Little Bus will be my future band name. And you’ll NEVER please Natacha (and she won’t ever move). FYI – the Red Line buses will be twice the size of a regular bus so they aren’t so little. Exactly, and they will probably be just as empty on this part of the run. Fresh Thyme is great. I along with a few of my downtown neighbors carpool and shop there weekly. We look forward to taking the Red Line to do so in the future. This BR location saves s a trip up to Castleton or down to Greenwood and we often grab a bite in BR at the same time, spending more $$ in the Village. How much economic prosperity is your finely groomed front yard generating in MK? We could mow it down and relocate Moe & Johnies there and make sure that we mow down the neighbors property so that there is a huge parking lot for everyone to park. Always someone with a smart little reply. I don’t love the smug comments from supporters. I also don’t love the hysteria from opponents. I will ask fellow supporters to get real and stop with the comments about selling their property. I don’t think that’s helpful. Will you ask fellow opponents to stop with the sky-is-falling stuff? That’s not helpful either. I can attest to how dangerous that parking is. Going by MJs is part of my route for my morning (or sometimes evening if my morning gets away from me…life with a toddler…) and I can’t even count the number of times somebody has almost backed into me simply because they weren’t looking. The Star has picked up the torch of passing on this false information. I thought they wrote their own version, but they just reposted the Fox59 article. Fox59 and IndyStar share some news gathering resources, so it’s not too shocking. Fox59 and IndyStar share some “news” gathering resources. Well, F me! I read the Fox 59 article and naively presumed the City / IndyGo were actually fixing this problem. Now, I see that they are leaving the whole 54th Street frontage as-is. Nothing like doing the minimum possible to make a big project “work”. As I read the above plan, the City will be building a sidewalk out where the street is now and maintaining (most likely improving for the owner free of charge, I’d guess) a drive aisle in the public right-of-way of College Ave where the sidewalk should be located. What is the point of this again? I read Chris B.’s comments, but I don’t understand why the curb cut to access the real private parking lot south of the building can’t remain where it is. Why in the world would they spend all this money on the Red Line project and keep a curb cut right at the intersection? What am I possibly missing that necessitates pushing the sidewalk out right next to the travel lane for southbound College? On another note, I gotta wonder how the project is going to impact the desirability of the existing outdoor seating areas for Twenty Tap, Fat Dan’s, Jazz Kitchen, Yat’s and others when they lose the on-street parking buffer and the vehicle travel lanes move right up adjacent to the curb. Ironically, Moe & Johnny’s is the only one that won’t be changed as southbound vehicle traffic will jog back to the same place it passes by now. The project appears to be designed to preserve as much of their precious private encroachments into the public right-of-way as possible. It reminds me of the Michigan Road “multi-use trail/path” that ignored most of the illegal encroachments into the right-of-way and created ridiculously long “crosswalks” across unnecessarily wide driveways and inappropriately located “off-street” parking areas. Don’t get me wrong…I think the drive aisle is stupid also. I was just trying to interpret. Anyone who wants to get into M&Js can just u-turn at the left-turn signal, unless of course they’re driving an Urban Assault Vehicle and can’t U across 2 lanes. DPW should just put back the sidewalk where it belongs, then Mack can expand his patio seating out to it. DPW can create a bump-out that allows truck turns from EB54th to SB College (which is how I presume Mack’s delivery truck roll out). The proposed u-turns are accidents waiting to happen. Not if the side streets are posted for “No Turn On Red”. There will still be a sidewalk buffer. It won’t be a whole lot different from Ambrosia and Binkley’s at Kessler and College. 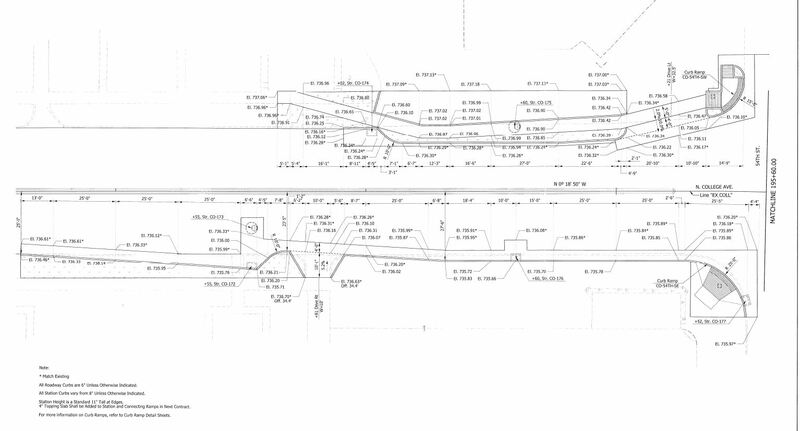 Unfortunately, that engineered plan is not high res enough to zoom in on and read. 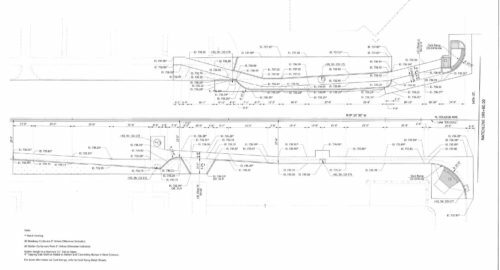 Perhaps Kevin has a clear copy and can chime in, but I’d estimate that’s going to be a 5-6′ max width sidewalk, with a 1-2′ buffer from the street. The difference with Binkley’s and Ambrosia is that the sidewalk is 15-18′ wide even after the outdoor seating areas. That provides plenty of room to walk and even pass others without walking next to the curb and passing traffic. That won’t be the case in front of Moe & Johnny’s. Of course, it will be a little bit better than the current situation. But considering that they’re redesigning the entire street, it’s disappointing that what’s being proposed is an island sidewalk strip with a private drive aisle (in the public right-of-way) on one side and an arterial travel lane on the other. Regarding the driveway, if northbound drivers need to u-turn at 54th to get to M&J’s legitimate parking lot south of the building, there’s no reason the curb cut can’t remain where it is. I guess this is an attempt to allow M&J’s to keep their illegitimate parking and continuous curb cut in the right-of-way of 54th and keep that parking connected to their legitimate lot. Why is that in the public interest? Any traffic engineer will tell you that the closer a curb cut is to an intersection, the greater the danger of collisions. Of course, Indy needlessly approved the Fresh Market curb cut about two car lengths from the intersection within the last decade, so perhaps this continued accommodation of the private interest over the public interest should not be surprising. I just keep hoping that we’ll start doing better. Pretty much devastate the Jazz Kitchen property parking. They, as well as others on College are on notice of eminent domain. The Jazz Kitchen property has no parking except a few street spaces that don’t belong to them. 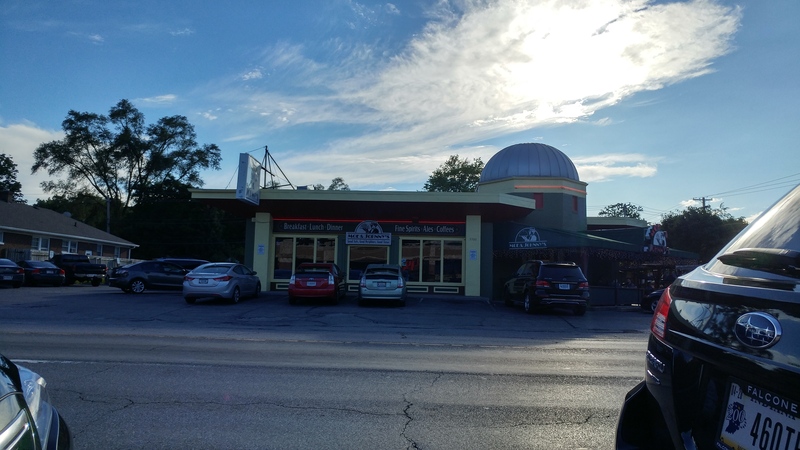 Somehow, Yat’s and Jazz Kitchen have managed to accommodate dozens and dozens of people at a time for years and years, with about ten or twelve curb parking spaces along College and 54th. Losing a handful of spaces in the area won’t kill them. Yeah I was confused there. I was thinking I missed parking at that building these last 8 years. Thanks for posting this article. The fourth image from the top appears to be from engineering plans – can you share a link to these? Really curious to see what is actually planned for College. The link on Indygo’s website (from which the third pic above appears to be a screenshot) for “plans” is nice but they are not a real depiction of what will be built. I was sent these engineering plans by another blog writer. I can ask him where he got them. Adverse possession does not apply to publicly owned land in Indiana, as is the case in most states. The underlying point however remains valid, and that is the city has been negligence to enforce agaiinst encroachment of public property by private entities. I have witnessed a number of alleys that have been taken over by homeowners who apparently have good reason to believe they can get away with it. Call the Mayor’s Action Center. Our Mayor’s Neighborhood Advocate says she tallies up all the complaints she gets in her area and takes the top few directly to the mayor. If your alley/sidewalk blocker is on the list, the mayor will eventually know about it. Gee, if that is all you need to do, I have a long list. Kevin, you can’t take those mapindy property lines as the actual site borders. Patachu has a much worse situation as far as the number of cars that can back over pedestrians. That entire intersection is very dangerous with line of site being blocked by cars parked near curb cuts. What is worse, the city ut these markings in. But we’re not talking about 49th and Penn, and that is not germane to a discussion about the Red Line on College. Except there’s an actual sidewalk at the front of where those cars park. If you walk/run behind where those cars are (and I admit I’ve been guilty of it from time to time) you’re taking a risk that you don’t have to. Oh, I know. I used to live in the neighborhood and occasionally walked my dogs past. But that was before Napolese, so it was more easily done in the evening. Excited to finally see this dangerous corner fixed!